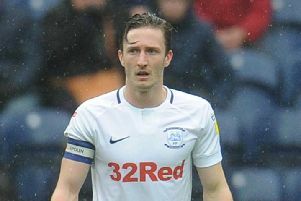 Alan Browne is looking forward to coming up against some former team-mates when Preston North End host Bristol City on Saturday. Old boys Bailey Wright, the Robins skipper, and Josh Brownhill, who is going from strength-to-strength in Lee Johnson’s midfield, will be among those tasked with halting North End’s charge this weekend. The Lilywhites are eight unbeaten and just six points behind City who occupy the Championship’s final play-off place ahead of the weekend. “It’s obviously good to see some familiar faces,” said Browne, who leads the way for PNE with 11 goals this season. “I think Bailey’s been unlucky with injuries over the last year or so but Josh has certainly upped his game and he’s a standout player for them now. City fans might not head to Deepdale in the best spirits though given their side’s recent record against PNE. It is six straight wins for North End who have not tasted defeat in 11 games against the West Country side in both the Championship and League One. “We’ve had a good run of results against them over the past few years and we’ll hope to continue that against them this weekend,” said Browne. “We know they’re a good team and I don’t think they’ve showed that anytime they’ve played us. “Every time I’ve seen them on TV they’ve been really good. “They’re a similar team to us in many aspects. They like to press and play out from the back but they’ve got a lot of good individual players as well. “It will be a tough test, especially with the form they’ve been in. “They’ve lost a couple in a row but prior to that they went on a great run of winning games. Part of North End’s impressive run against City included last year’s 2-1 win at Deepdale, Browne setting PNE on their way with a fine chip. After nine in all in 2017-18, the midfielder’s goalscoring form has continued this season with 11 to date. “I saw the goal on Twitter the other day and there’s a few people sharing it with the game coming up,” Browne said. “It’s a good one to look back on and hopefully I can add another one to my collection this year.